Investigate structures of DNA and determine if other molecules (protein or other chemicals) are bound in the major groove of the DNA or the minor groove. Use this collection of structures to see how molecules interact with DNA. Both proteins and drugs bind to specific sequences in DNA by recognizing the three dimensional shapes. When proteins bind to DNA, they can modify the DNA structure, repair DNA, or copy information. When anti-cancer drugs bind DNA, they can block DNA replication. Download Instructions for the DNA Binding Lab. Download the worksheet for the DNA Binding Lab. Download the DNA Binding Lab glossary. 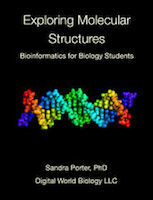 Learn more about investigating DNA structure in Exploring Molecular Structures. To view the collection, you will need to download and install the iPad version of Molecule World. Once Molecule World is installed on your iPad, return to this page and download the entire DNA Binding Lab collection at once by clicking the mwc file. A double-stranded DNA molecule. Hydrogens are shown because this structure was solved by NMR. A double-stranded DNA molecule. Hydrogens are not seen because this structure was solved by X-ray diffraction. A double-stranded DNA molecule with a protein bound in the major groove. A double-stranded DNA molecule with a drug bound in the minor groove. Unknown 01: A double-stranded DNA molecule with a bound substance. Unknown 02: A double-stranded DNA molecule with a bound substance. Unknown 03: A double-stranded DNA molecule with a bound substance. Unknown 04: A double-stranded DNA molecule with a bound substance. Unknown 05: A double-stranded DNA molecule with a bound substance. Unknown 06: A double-stranded DNA molecule with a bound substance. Unknown 07: A double-stranded DNA molecule with a bound substance. Unknown 08: A double-stranded DNA molecule with a bound substance. Unknown 09: A double-stranded DNA molecule with a bound substance. Unknown 10: A double-stranded DNA molecule with a bound substance. Unknown 11: A double-stranded DNA molecule with a bound substance. Unknown 12: A double-stranded DNA molecule with a bound substance. Unknown 13: A double-stranded DNA molecule with a bound substance. Unknown 14: A double-stranded DNA molecule with a bound substance. Unknown 15: A double-stranded DNA molecule with a bound substance. Unknown 16: A double-stranded DNA molecule with a bound substance. Unknown 17: A double-stranded DNA molecule with a bound substance. Unknown 18: A double-stranded DNA molecule with a bound substance. Unknown 19: A double-stranded DNA molecule with a bound substance. Unknown 20: A double-stranded DNA molecule with a bound substance. Unknown 21: A double-stranded DNA molecule with a bound substance. Unknown 22: A double-stranded DNA molecule with a bound substance. Unknown 23: A double-stranded DNA molecule with a bound substance. Unknown 24: A double-stranded DNA molecule with a bound substance. Unknown 25: A double-stranded DNA molecule with a bound substance. Unknown 26: A double-stranded DNA molecule with a bound substance. Unknown 27: A double-stranded DNA molecule with a bound substance. Unknown 28: A double-stranded DNA molecule with a bound substance. Unknown 29: A double-stranded DNA molecule with a bound substance. Unknown 30: A double-stranded DNA molecule with a bound substance. Unknown 31: A double-stranded DNA molecule with a bound substance. Unknown 32: A double-stranded DNA molecule with a bound substance. Unknown 33: A double-stranded DNA molecule with a bound substance. Unknown 34: A double-stranded DNA molecule with a bound substance. Unknown 35: A double-stranded DNA molecule with a bound substance. Unknown 36: A double-stranded DNA molecule with a bound substance. Unknown 37: A double-stranded DNA molecule with a bound substance. Unknown 38: A double-stranded DNA molecule with a bound substance. Unknown 39: A double-stranded DNA molecule with a bound substance. Unknown 40: A double-stranded DNA molecule with a bound substance.